Apple Cinnamon Infused Water keeps you hydrated for long. Apple keeps you full for longer duration and cinnamon boots metabolism. 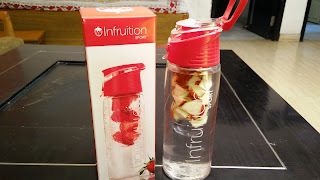 Apple Cinnamon infused water detox the body from inside, cleans our kidneys as well. 1. In the infused water chamber, add cut pcs of apple and cinnamon stick. Leave space on top of chamber, do not fill it till the top. 2. Pour filtered water in the water bottle. Set the fruits filled chamber in the water bottle. Keep it for half to one hour. Infused water is ready to drink. Enjoy detox water!! !